If you’re worried about what to do in summer to keep the kids entertained and to make the most of all those days off, you’re going to love this summer family fun kit. It’s full of fun ideas and activities the whole family will enjoy! Every year I look forward to the end of the school year because our normally busy weekdays become immediately more relaxed. I love letting the kids stay up a little later to take advantage of the extra daylight and to make the most of the time we have together after my husband’s work day. Yet, even though we all look forward to having fewer demands on our time during the summer, inevitably, we find ourselves missing the routine and flurry of activities a couple of weeks into summer vacation. In preparation for this year’s inevitable, “we’re bored” mantra that I expect to hear sometime in late June, I’ve prepared a summer family fun kit. This printable pack is full of ideas for what to do in summer so we don’t find ourselves twiddling our thumbs (or driving each other nuts) by mid-July. What Is In the Summer Family Fun Kit? I have several go-to family activities and I included several of them in this summer family fun kit. For example, I love scavenger hunts! So, one of the activities included in the kit is a scavenger hunt. Also included in the summer family fun kit is an idea sheet with 35 fun things to do in summer. When you get stumped, this idea sheet is certain to have an idea you can use. The kit also has a printable sheet you can hang up to remind kids what to do when they are bored. I plan on sending the kids to check this sheet BEFORE they complain to me about having nothing to do. Every summer I vow to keep a closer eye on my kids’ screen time so they don’t spend the entire summer vegging out in front of the TV. This year I hope to really stick to that plan by posting screen time rules. On the sheet, I’ll list chores and activities the kids can do to earn screen time each day. Family movie night is another favorite activity in our home. Inside the summer family fun kit, you’ll find a list of over 30 wonderful family movies. At the start of summer, I always have lofty goals related to what we’ll accomplish and do over the break. This year I’m using summer activity “badges” that we’ll earn so that we check off some of my most important summer bucket list items. Success! Now check your email to confirm your subscription and get the download link for your free printable Christmas planner. Want to Beef Up Your Summer Family Fun Kit? 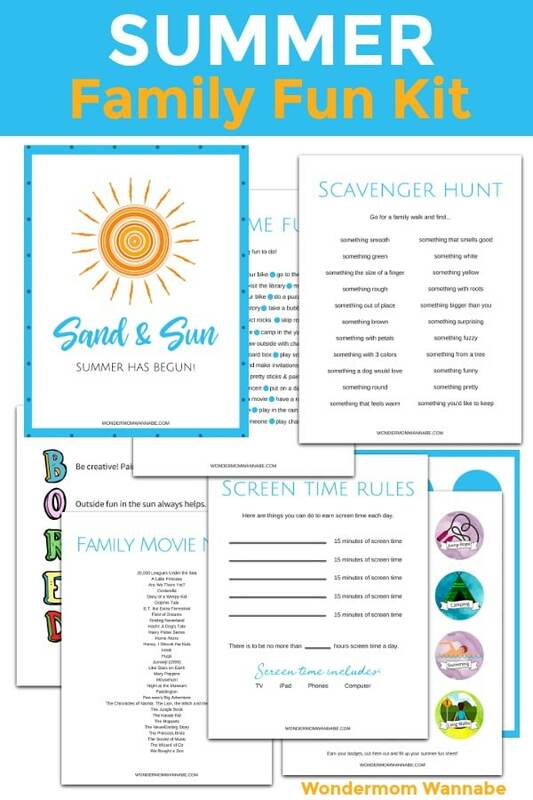 The printable summer family fun kit has plenty of activities and ideas to keep you occupied this summer. But, if you really want to supercharge your “ready for summer” kit, keep some of these items on hand. Playground balls – play 4-square, kickball, dodge ball, relay races, etc. Large paper pads and paint – create your own family art gallery! The summer family fun kit has plenty of ideas to help you decide what to do in summer. However, if you still get stumped, here are some more suggestions. 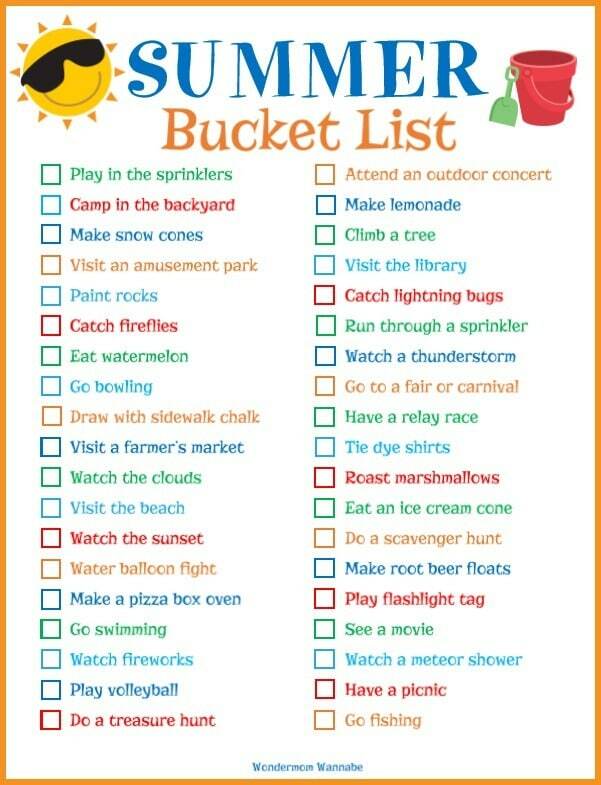 Print off this Family Summer Bucket List and try to check off all the activities before summer ends. 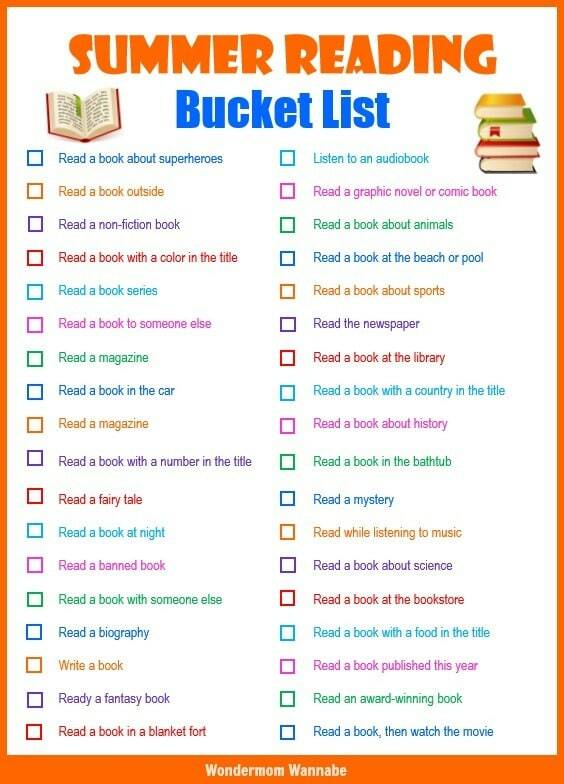 Start a family book club for the summer or compete to see who can finish this summer reading bucket list first. 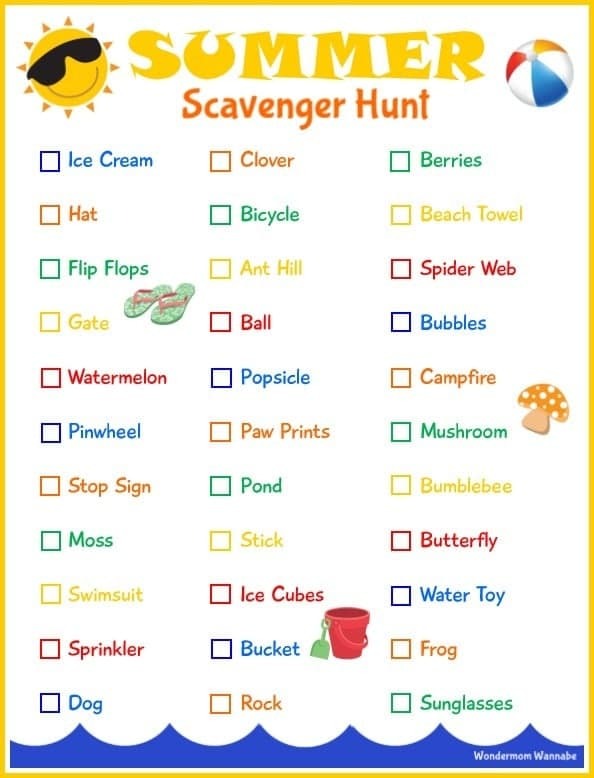 If you enjoy the scavenger hunt that’s included in the activity kit and want to do another one, here’s another summer scavenger hunt. If you want to make the most of the warm, summer weather try one of these family outing ideas or some of these outdoor activities for families. Worried about summer brain drain? Do one of these fun, educational activities with the kids. Or, try one of these activities in a jar. 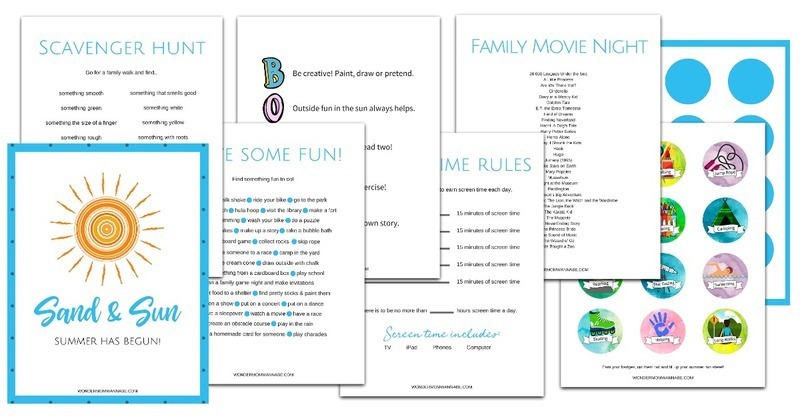 There’s no need to be stumped about what to do in summer now that you’re armed with a summer family fun kit and plenty of other ideas and printables! What’s your favorite summer family activity? Share it in the comments. This is so helpful! We try to get outside as much as possible over the summer so it’ll be nice to have some more options as to what to do.